London’s location is great for many in-country day (or half day) trips – Stonehenge, Bath, White Cliffs of Dover, Cambridge, Windsor, and more. In the end, Bath won our vote and luckily, it was a very easy day trip. From the Paddington tube station, there are trains that leave about every 30 minutes to Bath (Bath Spa station). We did not buy tickets ahead of time because we didn’t want to commit to a certain day, so this allowed us the flexibility to sleep in after a late night out. We took our time in the morning and made it to the Paddington station with enough time to catch the 10:30 train, which got into Bath at noon. One word of caution – our credit cards didn’t work in the machine because they don’t have the microchip that is sometimes required in Europe. Therefore, we had to stand in line (which moved quickly) and pay our ~£60 to the cashier (price for one way, for two adults, during “super off-peak” travel time – the early trains would have been more expensive since they were during prime traveling time). To save some money, do plan to buy tickets online ahead of time. As we stepped off the train in Bath, we were greeted with cool, crisp air (fresher and colder than London). We walked about 5 minutes from the train station and I found myself standing in a pedestrian zone filled with retail shops! It was very unexpected – I envisioned a quaint country town, not a modern city with shopping (it was a pleasant surprise). We also had a surprise with a Christmas market. When we researched Bath, we found information that the Christmas market would not be there in late November, so this was a real treat! Our first stop in Bath was the Royal Crescent (see picture below), but just to admire it from the outside. One of the houses is open to the public (it was closed for renovations while we were there), and there is also a Royal Crescent Hotel. It’s uphill and away from the main square and a nice break from the crowds. Immediately after that we looked for a place to eat lunch. We walked around until we found The WestGate Pub. We were intrigued by the menu, which consisted of some of the traditional pub grub (like fish and chips, which is what Ryan was looking for) and also some unexpected options like burgers and nachos. It was about 1:15 when we walked in and we were able to find an empty table in a cozy corner in one of the rooms on the ground floor. There was more seating upstairs, but the downstairs area was fairly packed. The pub was set up more like a house than a restaurant, with separate dining areas and mismatched furniture throughout. Overall it was the best pub meal of the trip, which might be because I opted for a burger and wine over a shepherd’s pie and beer. 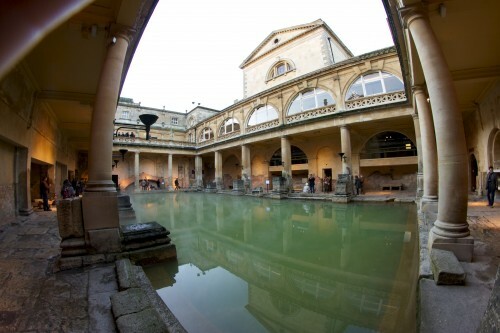 After lunch we headed for the main attraction of the day – the Roman Baths. If you’re in Bath, do not miss this! The cost is £12.75 for adults and includes an audioguide, which is a fantastic way to learn about the history of the baths and how they were used. In additional to the normal guides (which is all we listened to), there was also an option for a children’s guide and one narrated by author Bill Bryson. We stuck with the normal audioguides throughout the tour, and we learned fascinating tidbits about the life of the wealthy. The baths were treated as a sort of health club or spa and both men and women were welcome. The tour starts at the upper terrace (built in the late 1800s as part of the site), then continues through an interior museum, and ends at the lowest level at the main bath area (pictured above), which splits off into side rooms with additional baths. We spent about an hour and a half here, but would have stayed longer if we had more time in Bath. Our quick day trip to Bath ended with a walk through the Christmas market and a stop or two for some quick shoe shopping. We made it back to the train station just in time for the 5:13 train back to London. 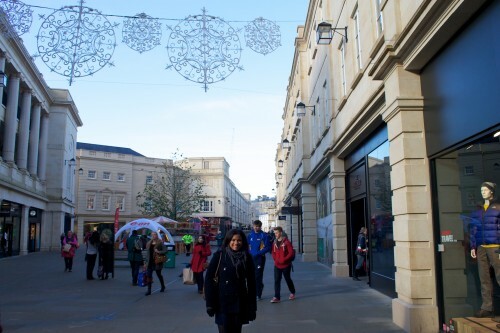 Even though Bath was touristy, it was a lot less so than London, and was a nice respite from the overly crowded streets of London. 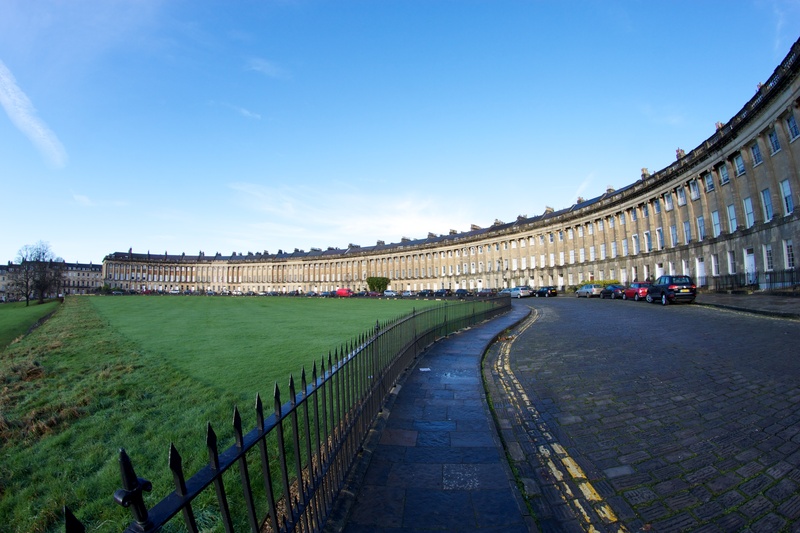 I definitely recommend a day trip to Bath for anyone visiting London (especially if you are staying for at least 5 nights) and even an overnight stay if you have the time. This entry was posted in Things To Do, Travel and tagged Bath, day trip, England, Europe, London 2012 Trip, UK by Kristin. Bookmark the permalink.